New Winter 2018: This smiling dude looks like he’s ready for a lazy cove rather than riding the wake, but you never know when guys hit the water. 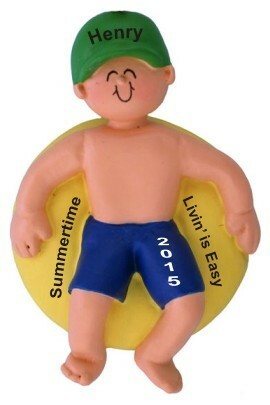 The inner tube male personalized ornament will put a smile on the face of any fellow young or old who enjoys some adventure out on the water. It’s one of many personalized beach ornaments from Russell Rhodes, so we will use a hand-painted font to add your details. The result is a unique boy ornament personalized just for him. Capture the fun of a favorite activity with the boy innertube personalized Christmas ornament in our classic velvet gift pouch.